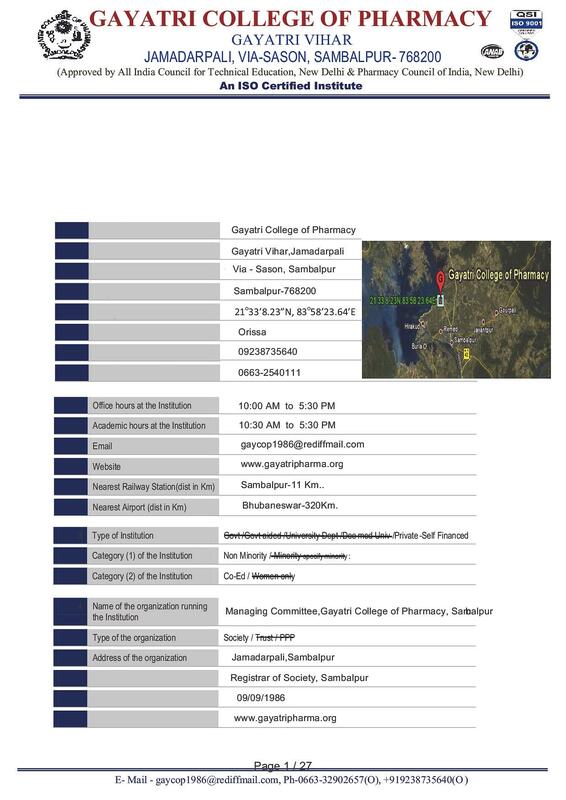 Gayatri College of Pharmacy was established by the founder Secretary, Sri Sibnarayan Satpathy and gradually Promoted by the founder director, Prof. (Dr.) Ashok Kumar Satpathy. The Institution is recognized by the Government of Orissa. The institution is approved by the All India Council for Technical Education, New Delhi and Pharmacy Council of India, New Delhi. It is also an ISO 9001:2008 Certified Institution. The campus of Gayatri College of Pharmacy is vastly spread over 5 acres of land, surrounded by evergreen landscape and scenery and below the footsteps of the longest dam Hirakud Dam. Gayatri College of Pharmacy strongly follows and abides by its mission which is to is to generate Pharmacy Professional with sharp perception, analytical skill and infuse in them professional confidence to meet the new challenges of Global Work Environment and to be a unique "CENTRE OF EXCELLENCE" through continual improvement. MEPRO PHARMA LTD. Jamnagar, Gujarat. Slide projectors and LCD fitted classrooms. A medical garden exclusively for the students to conduct study on crude and herbal drugs. The institution has its own fleet of buses for the students and faculty and also buses to and fro from the institution to Sambalpur City. 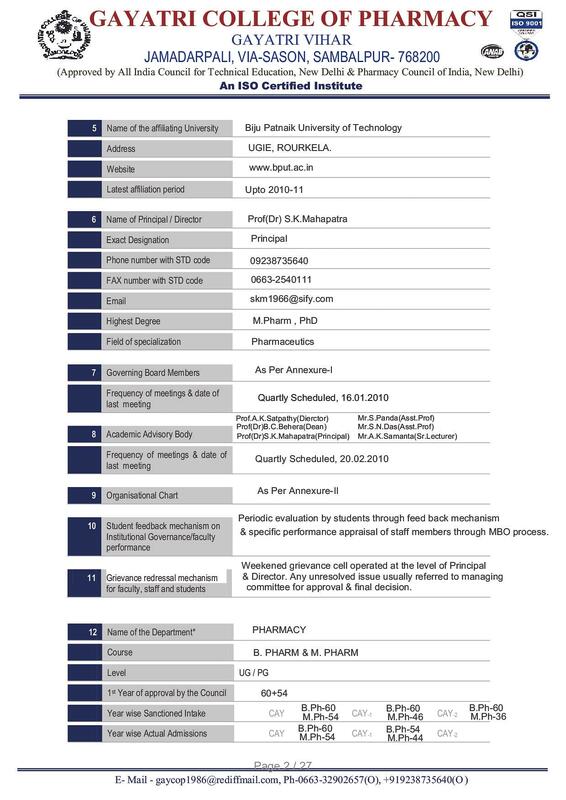 Why to take admission in Gayatri College of Pharmacy? 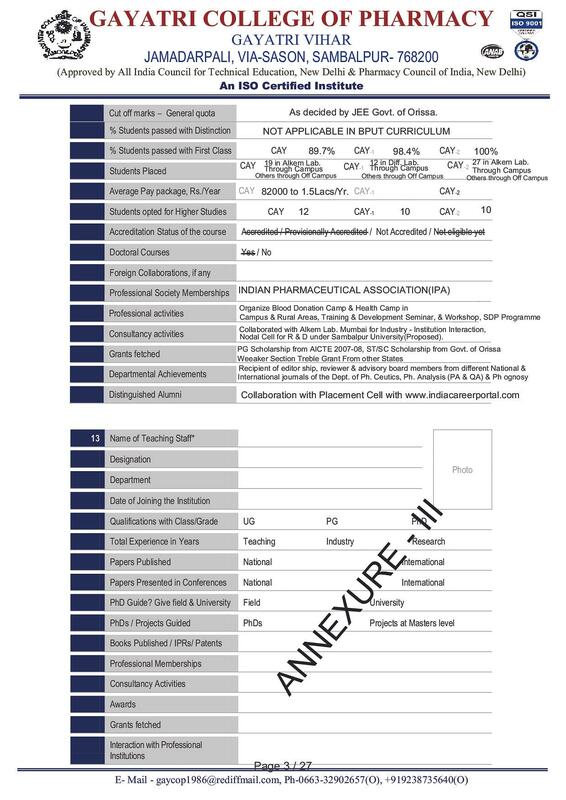 Gayatri College of Pharmacy is registered under the IAO (International Accreditation Organisation) which places you among leading educational Institution internationally and nationally and helps students worldwide to achieve their educational and professional goals. The entire faculties in Gayatri College of Pharmacy are Ph.D.’s, so the education is at its best and the finest among the colleges in Orissa.